• Brand loyalty and Corporate & Social Responsibility. This workshop aims to explore the four pillars of CSR. Good CSR policies drive corporate change. With well defined objectives and measurable targets, your CSR policy will provide the foundation for steps towards running a more sustainable and ethical business. 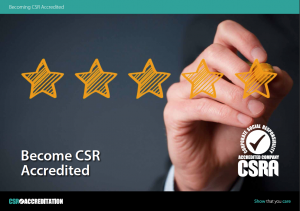 This workshop guides you through the process of CSR Accreditation Application. 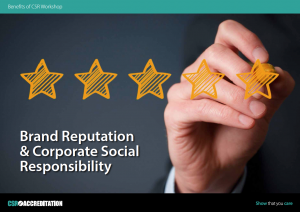 It explores the CSR four pillars and how you can pull together the information you need to delver a compelling CSR policy. Start improving the reputation of your business right now! at their premises for multiple delegates. Price on application.